Stylish in this falls new colors of red, kelly-green and turquoise. Popular garden gate quatrefoil pattern with navy blue trim. 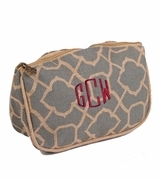 Personal accessory pouch for bath and beauty, ipad tech tablet or work school necessities. Crafted from jute, which is a sustainable and eco-friendly product. 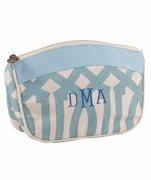 A zipper along the top of the bag makes for easy access and the compact size makes it perfect to slip into your luggage. NOTE... EMBROIDERY THREAD WILL BE NAVY BLUE TO MATCH THE TRIM. 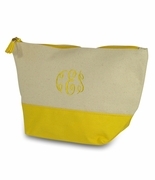 Add the matching tote bag, search item GCBK-29459. 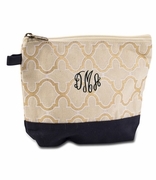 Monogrammed jute accessory pouch measures 12"W x 9.5"H with envelope bottom.